My favorite science fiction novels for younger readers were the ones by Robert Heinlein, but his friend and fellow writer Isaac Asimov also wrote some that I thought were pretty good when I read them as a child. 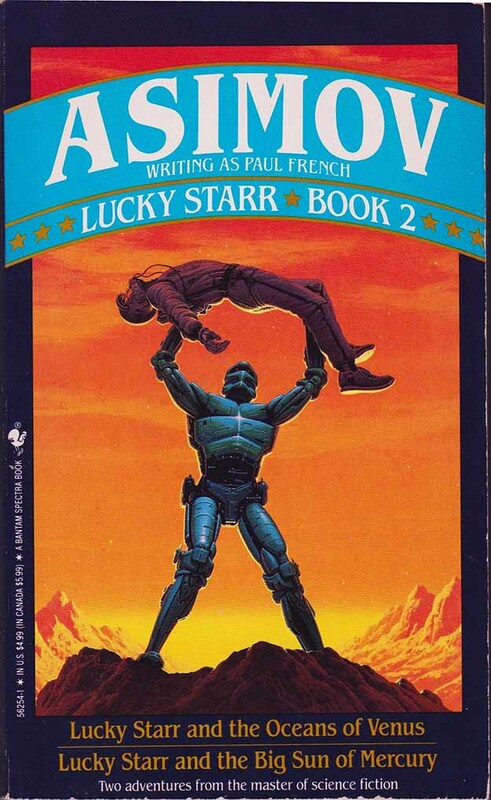 I didn’t know they were by Asimov until later, as he wrote them under the pen name Paul French. There were six short novels in all, this book has the middle two. I remembered some things from the Venus one, but nothing from the Mercury one, so I may never have read it before. These are essentially mystery and action/adventure stories in the tradition of the science fiction pulp magazines. The mysteries are clever and the action is entertaining, but the characters are far from complex, more caricatures than anything. David “Lucky” Starr is the intrepid hero with a clever mind for solving mysteries, and his sidekick John Bigman Jones is there for comic relief, fight backup and to ask the Dr. Watson questions. The science they were based on was accurate for the time, but the Venus one in particular—of an ocean world—has been completely ruled out by later discoveries. There are less obvious science flaws in the Mercury story. I enjoyed reading them, but they do not hold up all that well to my adult ideas about good writing. I may reread the others at some point, but it won’t be a high priority. This entry was posted in Books, Reviews on April 8, 2019 by Todd.